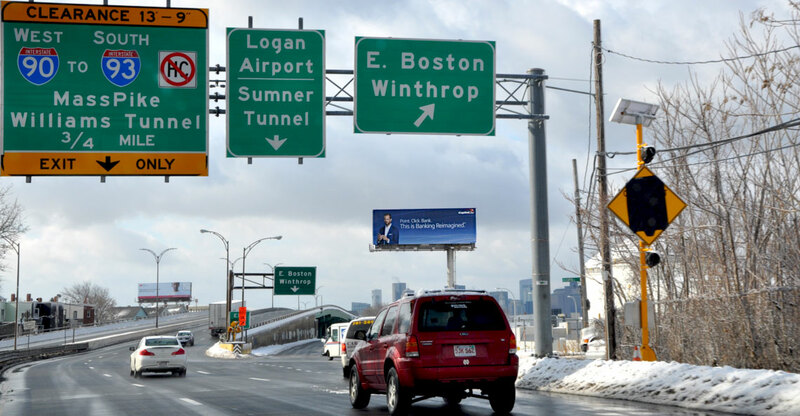 This high profile McClellan Highway – Sumner Tunnel/Route 1A bulletin reaches inbound traffic to downtown Boston (Government Center/Quincy Market,TD Garden, Storrow Drive/ Fenway Park and Rte 93-heading north to Middlesex/Essex County and southern NH), Mass. Pike, I-90/ Ted Williams Tunnel as well as the Boston Convention Center/Seaport District, Logan Airport from the North Shore Communities including the upscale towns of Swampscott and Marblehead. This visually impactful bulletin has a long direct viewing approach with a desirable high traffic count with morning traffic back ups. The North Shore beaches and Suffolk Downs are also destinations that are influenced by this bulletin on an annual basis.